21.06.2015. Georgia has described itself as the hidden tourist gem of the Caucasus for many years. Aided by government-led promotion and online marketing, tourists from around the world are opening their eyes to the country’s treasure trove of attractions. Situated at the crossroads of Europe and Asia, Georgia has had cultural interactions with neighboring Russia, Azerbaijan, Armenia and Turkey for centuries. As a result, the tourism experience is multifaceted and multilayered, offering a mix of historic sightseeing, religious tours, cultural events, winemaking, spa-bathing and caving. Georgia has an extremely diverse climate and terrain, from the Black Sea coast to the Caucasus Mountains, and from alpine meadows to semi-deserts, valleys and wetlands. Visitors can go skiing, paragliding, horseback riding, rafting, biking, hiking and ballooning. The capital, Tbilisi, in eastern Georgia, has a 1,500-year history manifested by medieval fortresses, narrow and winding alleys, timeless religious buildings, balconied wooden houses, saunas and spas. The Sulfur Baths in Old Tbilisi is a spa facility that uses naturally heated mineral spring water. 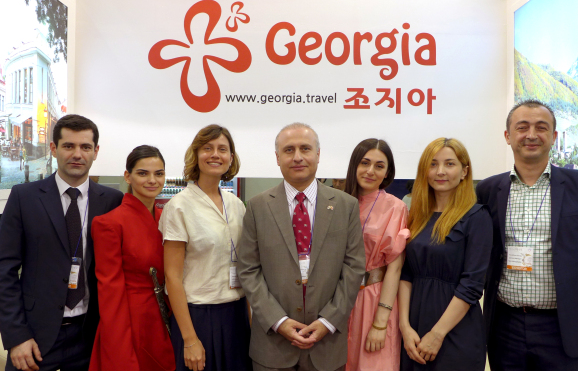 Last year, 3,000 Korean tourists visited Georgia, a 22 percent increase from the previous year. Places most frequented by Korean tourists are Tbilisi; Gori city where Joseph Stalin was born; Kazbegi village on the slopes of Mount Kazbegi; Batumi city on the Black Sea coast; the former capital, Mtskehta, with its many monasteries and churches; and Kakheti province, which is famous for wine. Kazalikashvili, who has lived in Korea for three years and now studies at Ewha Womans University, said the key cultural similarity between Georgians and Koreans is the “our thing” mentality. “As Georgia is a small nation of less than 4 million people, and has experienced many wars, our people have a strong pride in our nation, culture and religion,” Kazalikashvili explained. Georgians have strong religions, and churches, mosques, synagogues, chapels and memorials exist side by side in many cities. The Uplistsikhe cave town, which dates back to the early Iron Age, is located on a rocky escarpment near the Mtkvari River south of the Greater Caucasus Mountains. It has been called the “fortress of the lord” for its pagan and Christian mountaintop architecture. Batumi, the “Pearl of the Black Sea,” is a popular resort destination for international tourists. It has a beachside boulevard lined with palm trees, cafes, hotels and casinos, and features world-class cultural events all year round. National parks and protected areas cover more than 7 percent of Georgia’s territory, and 75 percent of the protected areas are forests. Many walking trails, where one can encounter a variety of fauna and flora and wildlife, have survived for centuries. Georgia has the longest unbroken winemaking tradition in the world stretching back 8,000 years. Earthenware vessels called the “qvevri” are buried in the ground, sealed and left for months to let the grapes ferment. The warm climate and moist air from the Black Sea provide ideal conditions for wine production, leading to more than 500 indigenous grape varieties. The Rkatsiteli white wine has a fresh and sweet taste, while the Saperavi red wine has a nutty and plummy taste. Lufthansa, Turkish Airlines and Qatar Airways offer flights between Georgia and Korea.